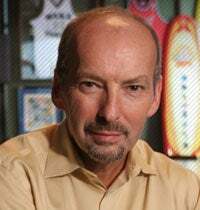 Back before he was heading up EA Sports or getting tatted up in the name of the Xbox 360, Peter Moore was a part Sega during a time when their shiny new Dreamcast console was floundering in the marketplace. When your core business is dying, tense situations are bound to crop up. In an interview with Esquire magazine, Moore relates one story that led to some very harsh words spoken to Sonic the Hedgehog creator Yuji Naka. While in Tokyo to present the results of focus group testing in which gamers likened Sega to "granddad with dementia who used to be cool but you couldn't remember why," Naka apparently accused Moore of tampering with the tests, which didn't sit well with Peter at all. "I lost it," remembers Moore. "I turned to the interpreter and said, 'Tell him, "F*** you"." Although the translator refused to convey Moore's feelings, he was pretty sure that his message got across. "Naka had lived in the US for three years, so I knew he understood. I walked out and never returned."